...slept til 8 both days. Usually I'm up by 6:30 so this is rare. ...spent some time helping Scott ready the garden before he leaves. ....ate a veggie burger for the first time. They're just the MorningStar frozen ones but OMG were they good. ....watched The Secret Life of Pets with Jett. My favorite thing about Jett, aside from the fact that he is loyal to a fault, is that he watches TV. He was enamored by this movie. Scout got up and left the room as soon as I sat down though because he has a low tolerance for closeness. ....saw this friend blooming again. The climate here is very odd and there are plants that do pop up every year, no matter what. ...watched the dogs dig a hole from where I was on top of the roof. They legitimately thought they were doing that unseen and froze when I yelled their names. ...the shed roof is just as high as the house roof. I did pull in a few Starbucks cards and some flowers for Teacher Appreciation Week. I attempted to start a new book. My Pilates calendar for May is looking sparse. And I haven't been drinking nearly enough water. And I did NO schoolwork because grades are in and work is done and all I have to do is show up for the next 8 days. Cheers to that. Wow, I can't believe your school year is almost done. I suppose that means are is too. It doesn't seem possible. Cheers to a productive weekend. Wow - your garden is awesome!! Your shed roof looks cool. How much property do you have? Looks gorgeous! LOL @ you spying the dogs on the roof. Love the pink flowers in the pot. I love Secret Life of Pets. So cute! I'm jealous that you only have 8 days left! Not that we're far behind. We have 13. Summer is almost here! I've not tried the MS burgers but their spicy chicken patties are to die for!! And yes CHEERS to your 8 days left, we have 8 including today. I love veggie burgers, but it is SO HARD to find soy-free ones! We have those Morning Star ones at the grocery store here but literally every single variety has soy protein. I need to keep experimenting at home with making them but they always fall apart. I love that you spied on your dogs...and the final school countdown has begun!! 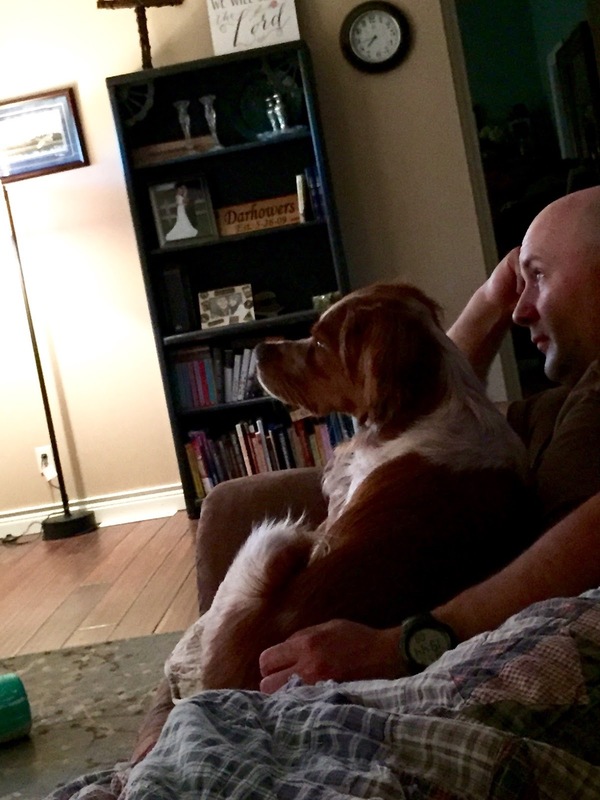 That picture of Jett watching tv is amazing! He is too cute! that book looks kind of interesting? i love when people take photos of books close enough for me to read the words. ha! so cute that Jett watches tv. i still haven't seen that movie. I yell at the dogs through the window & they just look so confused. "Where is she?! I don't see her! How does she see us?!". I love it. Hopefully it's not for too long.